How am I connected to ‘Senses’ in my everyday life? What interactions do you observe –between birds, and between birds and their environment? How do human impact birds and how can negative impacts be mitigated? How the Robin Got Its Red Breast: A Legend of the Sechelt People – illustrated by Charlie Craigan. Gather students in a circle and step into the circle if the statement applies to them, then step back out. You can name three species (ask them to define term) of birds found in B.C..
You can name three things birds eat and which birds eat them. You have every used binoculars. 2. Play a round of Eye Spy- used to learn what field marks in birds are. Put students into pairs, have partners describe each other using hair colour, size, clothing type and colour, eye colour, footwear. Compare these characteristics to how field guides identify birds (colour, size, distinguishing features, …). Would all features of their partners be the same in different seasons? Note birds change plumage sometimes with the seasons (or with age!). You must be quiet and still to observe birds. Birds share common physical adaptations. Birds have many unique physical and behavioral traits that help them to survive in their particular environment. Birds make sounds to communicate about territory, danger, food, and to locate one another. Birds’ beaks come in many sizes and shapes. Beaks are different because of the different jobs they do. Beaks are similar to simple machines. Wing shape and structure helps a bird to fly. Feathers have different functions and are a physical feature unique to birds. Some birds migrate when the weather changes and their energy source decreases. Prior to entering – Let students know that there are many stuffed birds that have been preserved in inside. These birds have been donated to the Outdoor School over the years and they are all representations of birds that live in this local habitat. It is very important that the students DO NOT TOUCH the stuffed birds. Tell them to walk around and take a good look at all of the birds and then sit down at table when they are done. See below at the bottom of this section for a list and description of the Forest Lab stuffed birds. Have students work in pairs or as a group to create a list of all the different types of birds they can think of. Then hand out the Cheakamus Centre double-sided seasonal field guides. Students can look around the Forest Lab to see if any of the stuffed birds are on the field guides. They can also see if any of the birds they know are there. Students can share stories they have about their interactions with bird with their partners or as a group. Optional Extension: Introduce the concept of a habitat (the place where a plant or animal normally lives and grows). Explain that ODS has several habitats (farm, forest, river, & pond) Ask what birds you would find at the farm? You can also introduce the idea of “biodiversity” (the number and variety of living things found within a habitat). Q: What do we see when we observe birds? What are some of their features?” “What do they have in common?” “What do you think they eat?” “How do they fly?” In other words – what makes a bird a bird? Remind students that birds, along with all animals, need air, water, and food in order to survive. 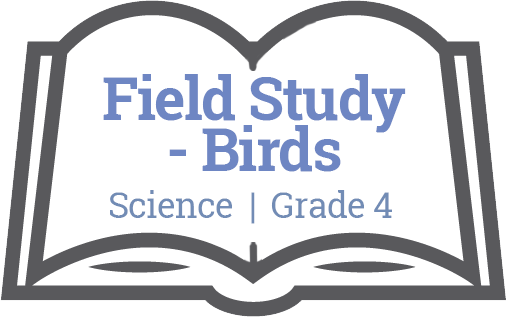 Begin a discussion with students about ways to observe birds. Most students have had experience chasing birds only to watch them fly away. Discuss how it is important to be very quiet and still while watching birds. A bird feeder is a great way to bring the birds closer. We do have a bird feeder by the Art Lab at the Cheakamus Centre. You can ask staff to help you fill it up with seeds to attract birds. What makes a bird a bird? There are more than 9,000 different kinds of birds in the world. Each bird has different structures that serve different functions in growth, survival, and reproduction. Some birds are very colourful to attract mates, while others are drab, which helps protect or hide them. Some are very big, and others are very small. Birds’ external physical features can enable them to carry out life’s functions in their particular environments. For example, some birds have very long wings that help them soar through the air, while some cannot fly at all. The differences are endless, but there are a few adaptations or traits that all birds have in common. All birds have beaks, two legs, and feathers. Birds have special body parts similar to a person’s vocal cords that allow them to sing. Birds use songs (which are longer) and calls (which are shorter) to communicate about territory (space), danger, food, to attract mates, and to locate family members or other birds of the same species. Each species of bird has its own song. Some birds are born knowing how to sing (inherited) and some learn their songs from their parents. Birds that live in different Habitats have different kinds of songs and places to sing their songs. We have a collection of CD’s and a CD player to use if you would like to share some bird calls with your students. Time to get outside! It is easier to understand why birds are making the sounds they are if you can also see their behaviors. Take your class outside and listen quietly for as many bird songs or calls as possible. Upon returning to the classroom, make a list of birds heard and compare them to the songs on the CD’s. If time or weather doesn’t permit this, you may also wish to show a few different examples for some general categories of why birds communicate (alarm, contact, territoriality or attracting mates). Follow bird map to see what you can find! Leave binoculars on table to dry. Group discussion of observations. What did you learn today about birds that you did not know already? What did you see that you had not observed before? This is a fun hook to get kids interested in bird watching. Quiet bird watchers see more birds! Write these on the board omitting the information in the brackets. Have field study groups compete against each other for score. Record the highest score. No points earned until you are back in lab. Bonus birds must be pointed out to teacher or counsellor. To equalize the group scores, groups can gain bonus points with recall of bird facts learned. More than one point can be earned, e.g duck (species, gender, interesting fact learned about species = 3 points.